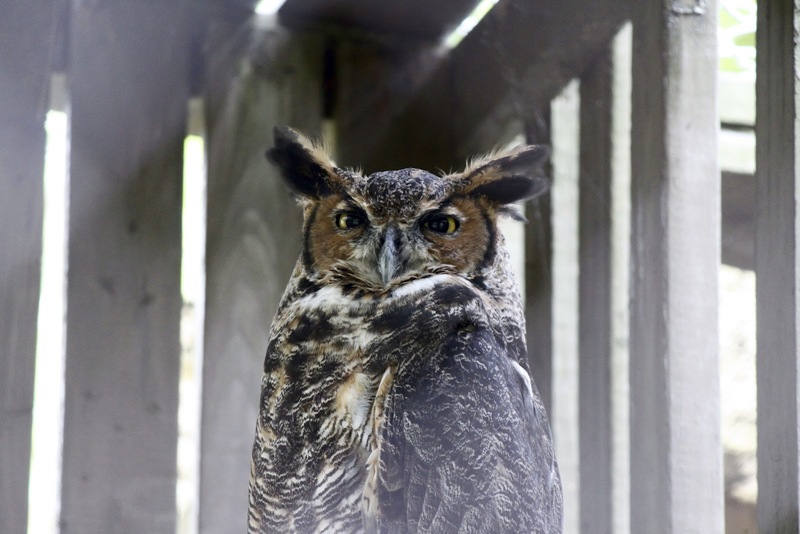 "Big Red", a female resident Great Horned Owl is a "foster Mom" to injured and orphaned young Great Horned Owls brought to the foundation so they can be released back into the wild when they are ready. She's a good Mama! 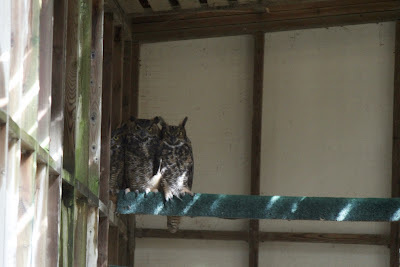 This past Saturday was our second trip to The Owl Foundation. This place and the work they do there is amazing to me. I was just as excited about our second visit as I was the first one. You can read all about that and the organization by clicking the above link or here for my blog. This year we were joined by our friends, Murray and Debbie. 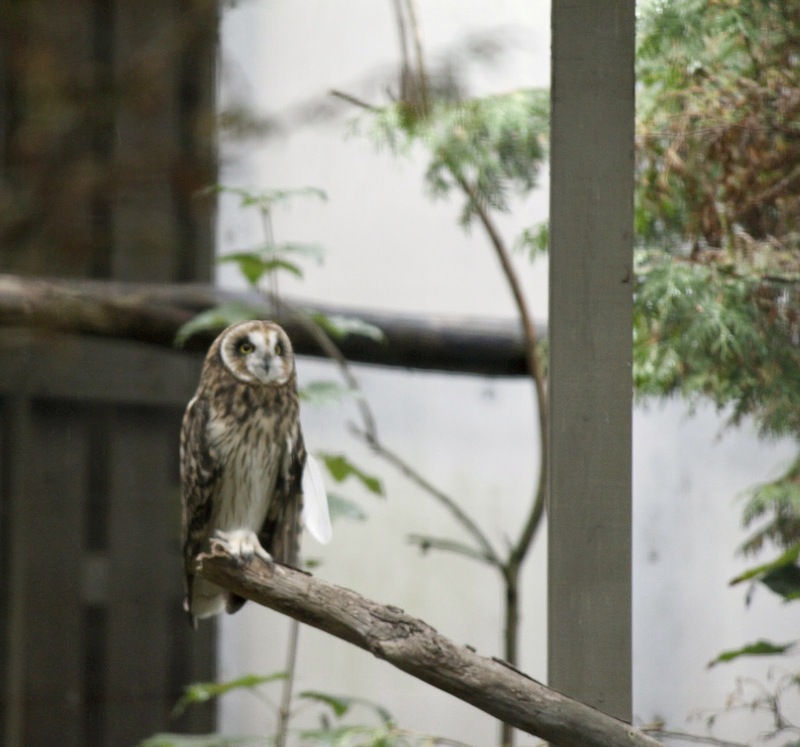 They had gotten married in June, and Rob and I sponsored a releasable owl for them as their wedding gift, which they were thrilled with. Our tour this year, started in the main house where we once again got to meet the "Owl Lady" herself and Co-Founder of the organization, Kay McKeever. At 88 years of age, she may of been a little slower moving then last year, but her spirit remains strong. I am grateful I had the opportunity to thank her for her dedication to the owls and her work once again. "Big Bird" greeted us as we entered the sun-room. 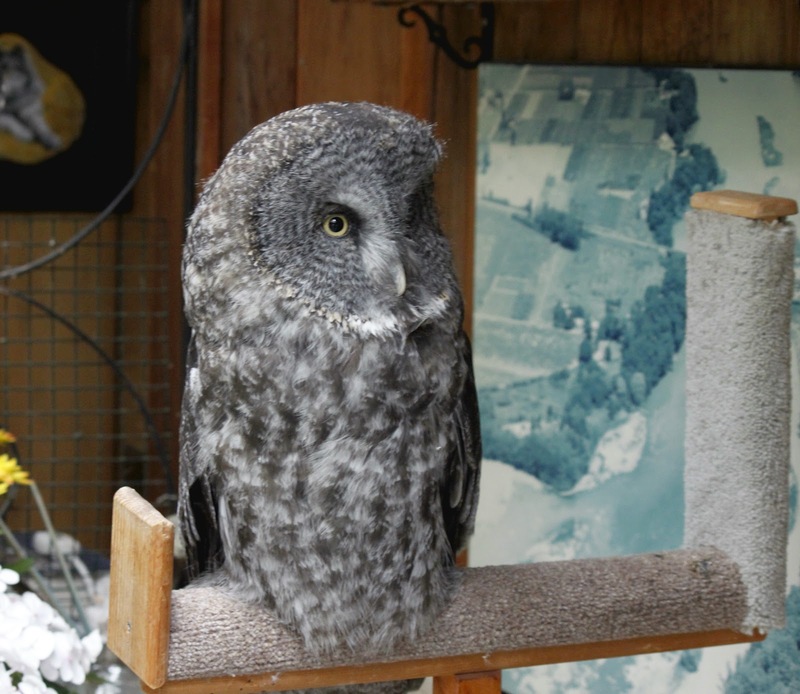 Big Bird is a severely injured Great Gray Owl that lives in the main house with Kay. Big Bird giving Kay some affection. After having a short visit with Kay our group was taken outside to the enclosures of the resident owls and the young ones that will be released next spring. 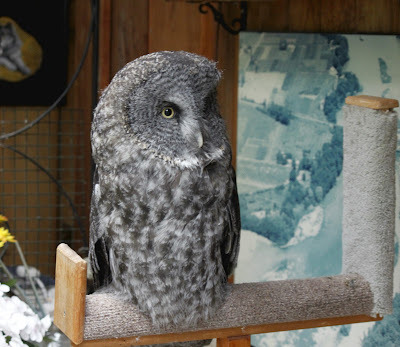 Any question we had was answered and stories and interesting facts about the many resident owls were told. Even though we had been there last year, it felt like a whole new tour, as so much can happen in a year. Rob took photos best he could, but all photos are through cages and protective screens, as West Nile Virus can take a terrible toll on the owls. Three young Great Horned Owls raised by "Big Red" to be released next Spring. 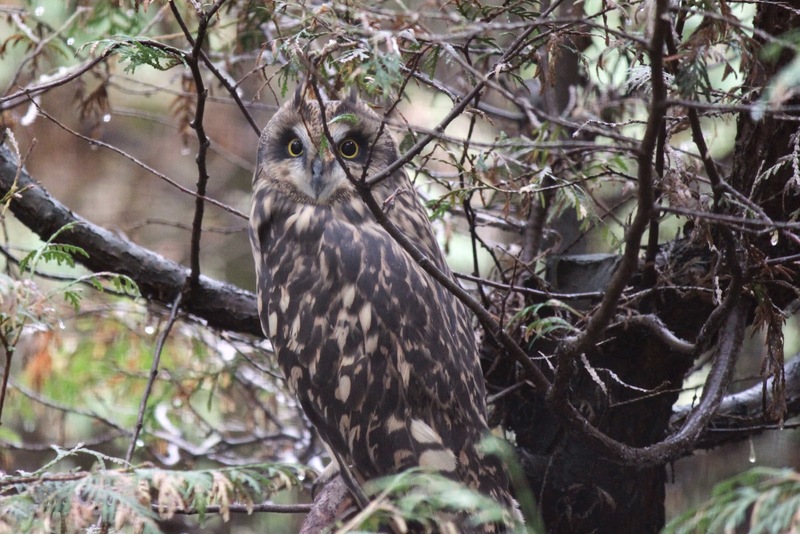 A young Short-eared Owl to be released next Spring. 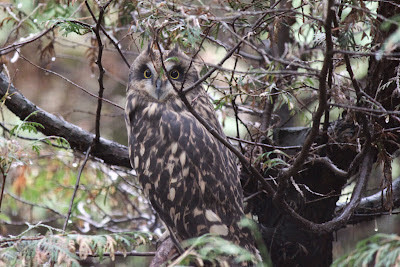 This tour we were able to view a Hawk Owl, which we have not seen in the wild. We also saw Saw-whet owls, and young Great Grays to be released, but without a doubt the highlight for me was seeing 3 young Snowy Owls. The Mama Snowy kept an eye on her young while we all stared in awe. Papa was snoozing in the corner. The 3 will be released in Manitoba when they are ready and able to survive on their own. 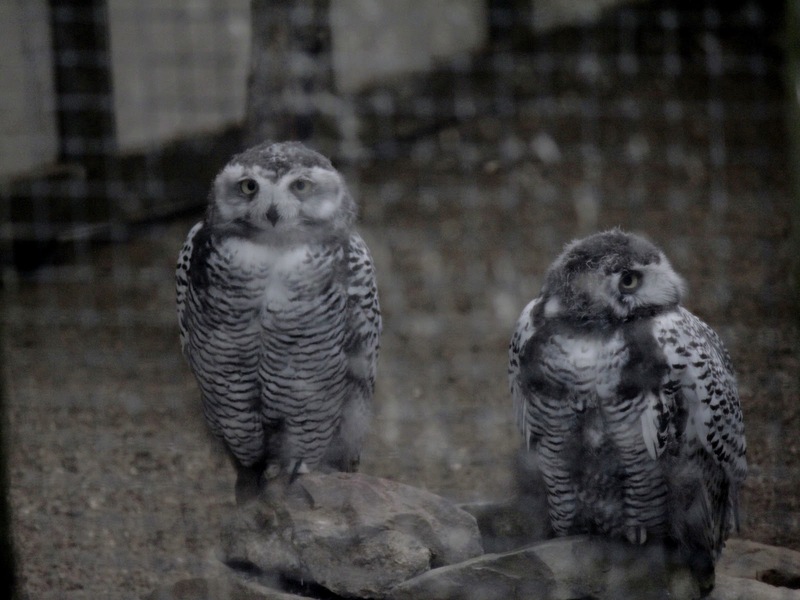 The Snowy Owl on on the left was doing his alarm call at the strange beings walking by his enclosure. 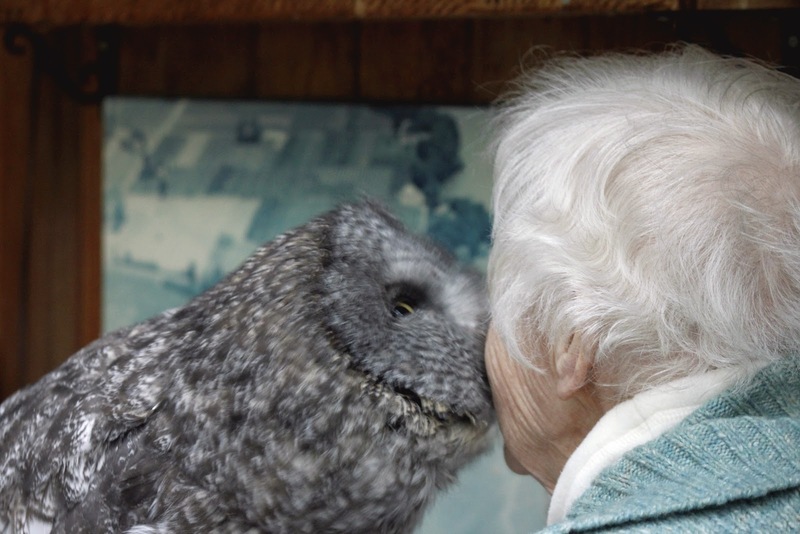 The Owl Foundation isn't open to the public, and sponsors are only invited to visit 2 weekends out of the year, in the Fall, as it is the least stressful time for owls. The owls here have very little human contact and how strange we must of seemed to these little guys. 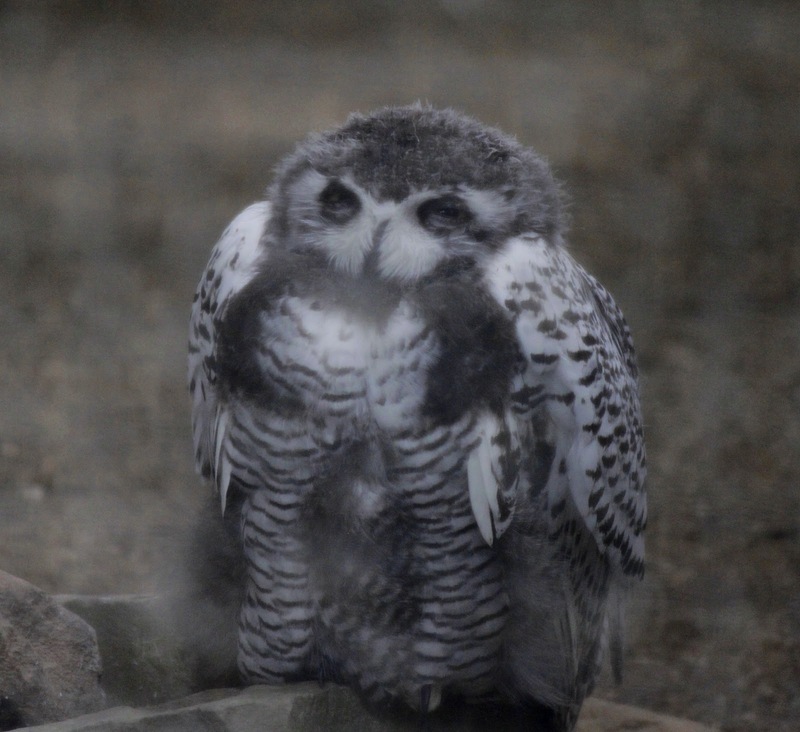 A young, very sleepy Snowy Owl. What a wonderful morning we had at a truly wonderful place. I encourage you to learn more about this organization and support them if you can. Sponsorships make wonderful gifts! Bird Bird and Kay are too cute! It takes special people to devote their lives to great causes like this one. Kay and her team are angels.